Mercer Warehouse — Gather Co.
42,000 square feet, and over a century of character. 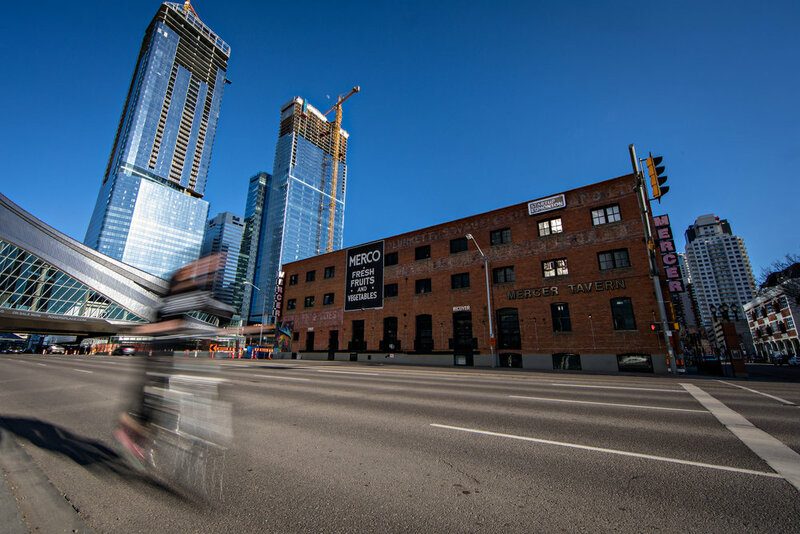 A one hundred year old building in Edmonton's warehouse district, the Mercer Warehouse is home to many of the city's brightest minds and builders. Behind our walls you'll find the city's finest coffee and cocktails, converse with inspiring creators, and get lost in the maze of great people and organizations. 10359-104 Street NW downtown, across the street from Rogers Place. Unique brick and beam construction, built in 1911. Heritage Area Zone with a Special Area Downtown overlay, which designates the Downtown area as a Special Area to achieve the objectives of the Capital City Downtown Plan. Paid hourly parking in alley to south of building, metered parking along 104 street. Keyfob door entry, 24 hour monitored security and evening security guard patrol. Nearby access to Metro Line (Rogers Place) and Valley Line (Enterprise Square) LRT stations. Affordable rental rates and flexible terms. Who you'll meet at Mercer Warehouse. Looking to make your mark?